There are isolated places in this region where Timber Rattlesnakes take up residence and Timber Rattlers are definitely poisonous and therefore potentially very dangerous. Though it's highly unlikely you will see one, I obviously need to warn you about them and pass on some useful information. They are incredibly shy and very afraid of people as they are hunted relentlessly which subsequently has put them on the endangered species list (note to potential hunters: get caught hunting these and the state of Connecticut does not mess around as far as punishment...jail time and huge fines are in your future). I personally have never seen one in my entire life (and never have heard of anyone getting bitten) but if you happen to come upon a rattler you'll likely hear it first before seeing it because the snake will no doubt see you first and shake it's rattler in effort to get your attention. 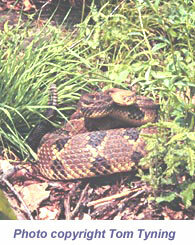 If you hear the rattle shaking...stop...don't take a step or move your arms in a fast manner. Just relax and locate the snake by determining where the sound is coming from. Once you spot it, slowly, calmly step back from the snake to give it the breathing room it desires. He/She is telling you "I'm scared too and I need you to back away from me"...if I were you I'd listen to that advice! A rattlesnake will only strike if it is stepped on, harassed, or you just won't back away from it. It will not charge at you or attack...it springs out from it's coiled up position and can only reach out as far as it is long so you'd have to be practically standing on it to get bit. If you have any questions about what to do in the event of a bite please visit Connecticut DEP Timbersnake page and use the contact info there to find out more. You should be more afraid of lightning strikes that a rattler strike because the odds are that the former would happen before the later but if you or someone you're with is bitten here are few things to keep in mind. Many bites are "dry bites" meaning the snake doesn't inject its venom. It's saying "you're not listening and backing away from me so the next bite will be the real bite!". If venom is part of the bite then symptoms will come on quickly. From the little research I've done, it seems just keeping the victim calm and relaxed until you can get them to a hospital is the most important thing to do rather than trying to treat the bite. The slower the heart beats, the slower the venom will go through the bloodstream and will delay the effects of the venom - severe pain, shortness of breath, nausea (sick feeling). If a victim does not make it to a hospital for many hours, the bite can be fatal but nearly all rattlesnake bites wind up being horrible events that result in serious injury and a hospital visit for anti-venom shots. Again, I've never seen one of these snakes in my entire life and have never heard of anyone bitten in the state of Connecticut in recent times so there's no need to be afraid (though I've probably succeeded in scaring the crap out of you!). I found this rattlesnake page at TNC - Berkshire which has great info concerning Timber Rattlesnakes. It was certainly good to read that in New York state there hasn't been a single documented fatality from rattlesnake in decades...so you'll be okay out there as long as you don't try to emulate the Australian crocodile dude who likes to jump on crocs, snakes, and other dangerous animals! eNature.com page also has some photos and useful information.